What I don't understand is why would someone not notice this horrible design. 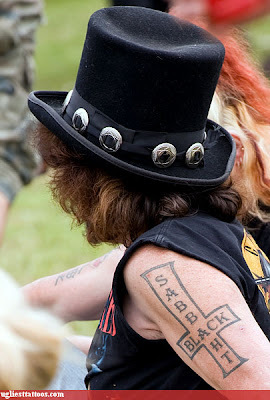 Not only is it spelled incorrectly, but its not the Sabbath logo. Are they truly that stupid, or is it a joke? I'd love to ask someone who has a tattoo like that, what the impetus behind it was. Bigglesworth Collective - Who Is Chad Bigglesworth?